Synopsis: Follows a brilliant, flamboyant and controversial British military figure and his conflicted loyalties during wartime service. Did You Know? At 227 minutes of total run-time, this is reportedly the longest film to have no spoken dialogue by a woman. Quotables: LAWRENCE: It’s my manner, sir: it looks insubordinate, but it isn’t. Bear in mind that I do not profess myself a historian. Quite the contrary, history does not interest me in the slightest, unless it’s Oscar history or fictional history from one of my many fandoms (ahem – Harry Potter and A Song of Ice and Fire). So I do not have the foggiest inkling how faithful Lawrence of Arabia is to its history, nor – quite frankly – do I care. I do not watch cinema for historical accuracy. I watch it for drama and laughter and excitement; in short, I watch it for entertainment. If I wanted something historically accurate, I would watch a documentary or read an autobiography, though I’m sure neither would be without their own embellishments. 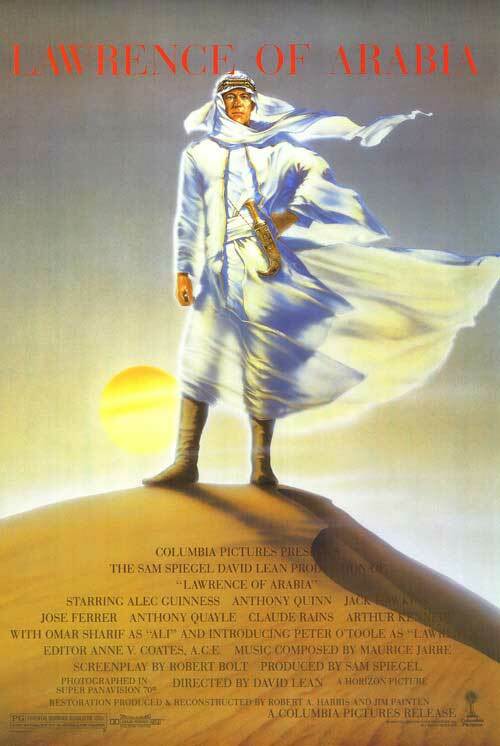 Lawrence of Arabia is a film of the utmost grandeur. It is magnificently beautiful, and superior to most any other epic drama. One, of course, must look past the gross lack of female characters and the fact that Alec Guinness is a white man playing an Arabic prince. It is astounding that this is one of Peter O’Toole’s first films; he commands the screen like a seasoned veteran. While I think he definitely deserved an Oscar for this film, I cannot say whether he was more deserving than winner Gregory Peck for To Kill a Mockingbird. Their performances were equal in skill.